The players entered the field with a mindset of working with one another. 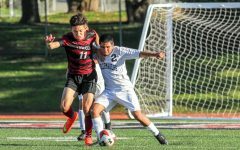 The boys’ soccer team claimed its title as Academic Athletic Association champions in a 1–0 victory against the Mission Bears on Nov. 7. In previous matches against the Bears earlier in the season, the Cardinals lost to them with respective scores of 4–0 and 2–0. Using this final match as a chance to redeem themselves, the players entered the field with a mindset of working with one another and letting it all play out on the field. The Cardinals kept possession of the ball throughout the first half. However, by the end of the half, neither team got on the scoreboard. This approach opened up space behind their defense, and allowed players to break through and pass the ball to the forwards. During the second half, the Bears controlled the ball. 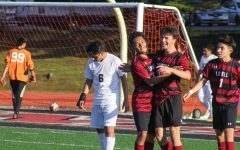 The team gained an advantage with a pentalty kick after sophomore midfielder Razmig Makasdjian was taken down on the field. Senior co-captain and forward Parker Moxley scored the penalty kick, which brought the score up 1–0. Lowell upheld the score for the remainder of the game, conquering the Bears at last. At the end of the day. the boys carried home the gold AAA trophy. The Cardinals sealed the season with a record of 10–3–2. They associated their wins to their overall strategy of maintaining possession of the ball in order to tease out the opposing team’s defense. This approach opened up space behind their defense, and allowed players to break through and pass the ball to the forwards. However, the team’s strategy required some time to adjust to, according to Moxley. “The change and learning how to play it was a challenge for the team, but all in all helped us in the end as well,” Moxley said. Strategy alone wasn’t enough to win championships. Head coach Juan Lopez attributed the team’s success to its hard work and the co-captains. 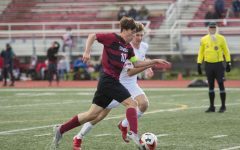 “Our captains (senior defender Noah Boden-Gologorsky, senior midfielder and defender Stefan Morgan, and Moxley) helped tremendously in their leadership roles by mentoring the younger players and creating a team friendly environment,” Lopez said. Despite some doubts about the team’s capability, the Cardinals were able to prove themselves with an accomplished season. “Although people didn’t expect us to even make it to champs, we were able to achieve our goal of winning the championship, which I think is pretty cool,” Boden-Gologorsky said.